The Easiest Low Carb Ice Cream treat. 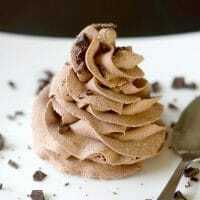 Frozen Chocolate Whips are so light and creamy! My Low Carb Ice Cream dreams have come true. 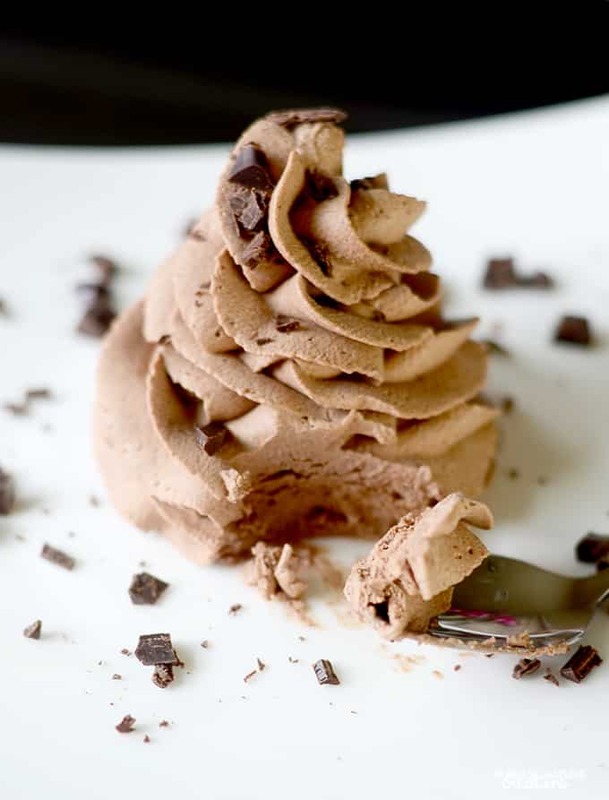 Frozen Chocolate Whips ~ Easy Low Carb Ice Cream recipe contains affiliate links for the support of this blog. Lately I’ve been craving ice cream, but I am avoiding added sugars. It’s summer and I NEED Ice Cream. I didn’t like many of the options at the store. They were sorely lacking in creaminess. That’s where these Frozen Chocolate Whips were born. 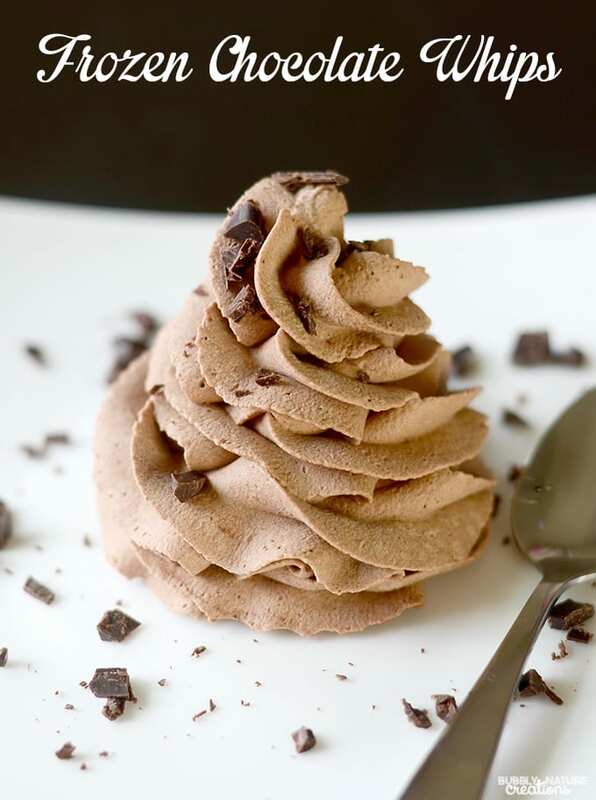 I wondered if I could just whip up some chocolate whipped cream and freeze it for a Easy Low Carb Ice Cream treat. I have to say that I think these are even better than I expected. 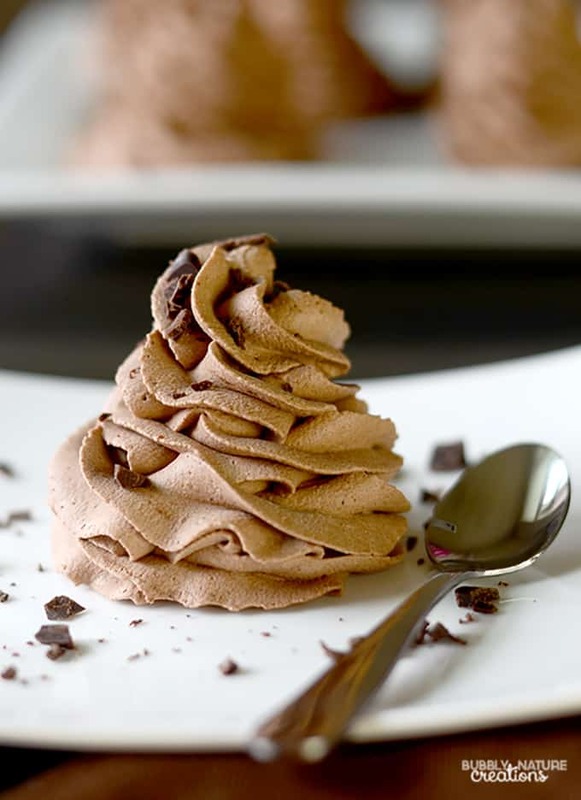 Frozen Chocolate Whips are so light and creamy! My Low Carb Ice Cream dreams have come true. I think they are perfect when they sit out for a few minutes before biting in (if I can wait)! They become soft and yet they have that frozen/icy bite to them. So why didn’t I just try my hand at a traditional low carb ice cream recipe? The short answer is that I wanted to have something that didn’t take a bunch of time or equipment. There is no churning, no scooping, and all you need to do is whip the cream! EASY! Frozen Chocolate Whips Low Carb Ice Cream really hits the spot for all my ice cream cravings. Whip the cream until it’s a thick consistency. Watch out for whipping too long which will cause the whipped cream to become butter! Use a silicone mat or parchment paper. I can’t stress this enough because you’ll want to be able to pull up the whipped ice cream easily! Wait a minute before eating if you can. Just like regular ice cream… Frozen Chocolate Whips get creamier if they are allowed to warm up just a bit. I think the whips are even better because if they completely thaw out… they keep their shape since they are whipped cream! Try different flavors. This recipe will work with many different flavors. I would add around 1 tsp. of any liquid flavoring for the best results. For example instead of the cocoa just add 1 tsp. of vanilla for a vanilla flavored version. I think strawberry or caramel would be great too. 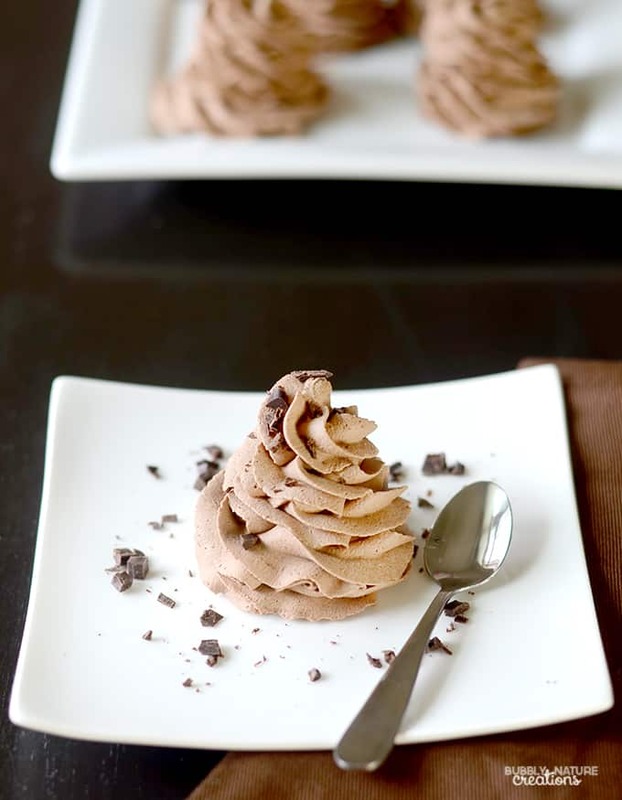 Check out this yummy recipe for Frozen Chocolate Mousse Kisses. 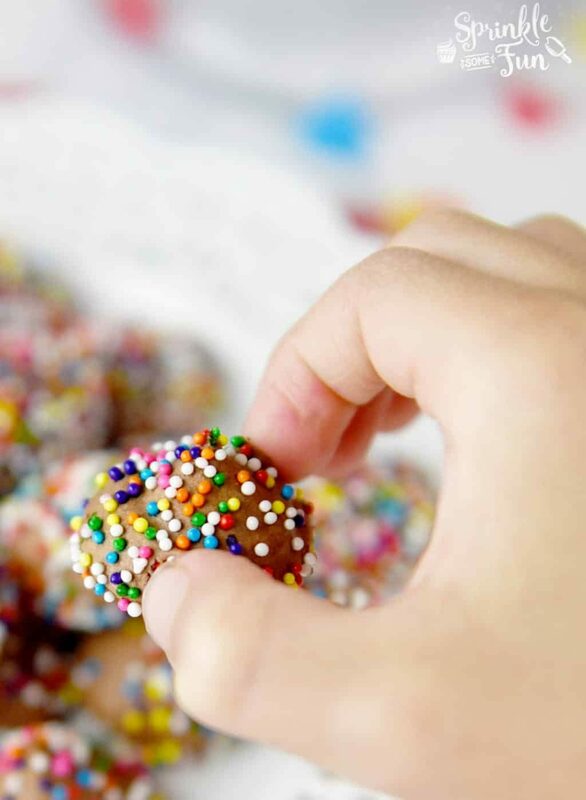 These are covered with SPRINKLES! You can also make these low carb too. Now I need to experiment with other flavors for this Easy Low Carb Ice Cream recipe! Which flavors do you suggest that I try? Can I make these dairy free? Yes! Just use your favorite dairy free whipped cream recipe and as long as the fat is comparable to this recipe they should hold up well. For example a coconut cream whipped cream would work really well. Can I use other sweeteners? Yes. Any sweetener should be fine and it’s what makes this recipe so unique compared to traditional ice cream. Ice cream relies on the sugars to keep it creamy and this recipe relies on the air inside the whipped cream to make it creamy. Using regular sugar would only make it even more stable, but it’s not necessary. The only issue would be with anything like corn syrup or other liquid sweeteners that might thin out the recipe too much. If you want to use a liquid sweetener just know that I have not tried it with a liquid before so it might not work as well. I did have someone suggest they used honey and that worked out okay for them. Are these Keto friendly? Yes they are. These would be about the equivalent of a fat bomb in the Keto world. Just make sure the vanilla extract that you are buying is sugar free. Sometimes they have added sugar. You can always omit the vanilla if you need to. It’s just there for added flavor. Can I make these with canned whipped cream? You sure can (that was an unintended pun LOL) with some caveats. I have been known to do this on occasion when I am not watching my carbs as heavily. The whipped cream in a can is not as thick so they need to be transferred to the freezer immediately! They also won’t keep their shape like the homemade version. This method will work in a pinch though. Are these good for the Trim Healthy Mama plan? Yes. This would be considered a DEEP S dessert. What is a piping bag? A piping bag is the plastic (or sometimes paper) bag that is used typically for icing cakes. They are triangle in shape and can be found at most craft stores. You can use a gallon zip lock bag in a pinch by cutting off the bottom corner of one side and using that hole to pipe through. You can also just dollop the whipped cream onto the parchment paper without piping it on too. The piping just adds a nice touch, but it’s not essential. Now I need to experiment with other flavors for this Easy Low Carb Ice Cream recipe! Which flavors do you suggest that I try? Put all ingredients into a large mixing bowl and beat on high with the whip attachment until the whipped cream has firm peaks. Transfer the chocolate whipped cream to a piping bag fitted with a 1M piping tip. On a parchment lined baking sheet swirl the whipped cream around into large mounds like soft serve ice cream. Make around 12 or so and freeze on the baking sheet for at least 1 hour. They will be set at this point and you can eat them or transfer them to a freezer safe plastic tub for easy eating later (affiliate links). If you are wondering each frozen chocolate whip has around 70 calories and 7-8 grams of fat... and 1.5 net carbs! Good idea! Let me know if you try it! hi what is swerve sweetener? Did you use the granulated or powdered please? Where do yo get the piping bags for this recipe? I am not familiar with those. Thanks! You can get them at any store that sells cake decorating supplies, such as JoAnn’s, Michael’s, or Hobby Lobby. I had some cream that was going to expire soon so I made a quarter batch and sweetened it with SweetLeaf liquid stevia. They were really yummy. This is great for a quick alternative to ice cream. Do you have to pipe them out or can you put it in a freezer safe container and eat it like that? Yes. They need to be piped or spooned into smaller portions because they are much harder than ice cream and you would not be able to spoon it out of a container. Just tried this and it was absolutely delicious! I didn’t have any vanilla extract around so I instead subbed it for 1 tsp. of my Unsweetened Vanilla Almond Milk. Worked just fine! Thanks so much- my sweet tooth is happy tonight! Just made these and they are DELISH!!! Super easy and totally hits the chocolate cravings! Oh and I just used a Baggie with the corner nipped off instead of a piping bag! Easy peasy! I’m gonna use half the cocoa and half pb2. Reese craving done. Does anyone know how much stevia you would need to use for this? I made these and they are wonderful! Thanks so much! I made mine with swerve. Delicious!! Kids loved them too! These are so good. I used Xylitol because I didn’t have swerve. Can you use other flavors like lemon? Can I use Swerve powdered sweetener? I made the chocolate version today and it was perfect! I decided to try to come up with a different flavor to go with the chocolate so I added the sweetener to whipping cream and then added vanilla extract and a splash of coconut extract. They are divine! If you eat half a chocolate and 1/2 of a vanilla/coconut version, it tastes like chocolate pie. I have a happy family! I don’t usual comment on recipes but I’ve made this twice and I 💜 it soooo much! I use 2 tbsp of cocoa and 3 tbsp of sourwood honey as my sweetener and they’re divine!! Do you have the macros for these? I was looking for something keto and chocolate. This is so good! Easy to make. It would taste good as pudding. Thanks for the recipe. These are so yummy! I was able to get 10 dollops. I have to say tho… it’s hard to just eat 1! It is hard! lol Thanks for leaving feedback. I appreciate it! I used Truvia and mine turned out gritty. Is it the truvia that did it? I’m not sure. You might try a powdered or liquid sweetener next time. Swerve and lankanto monk fruit are my favorites although I know most don’t have those at their grocers. You can find them on Amazon. Frozen Chocolate Whips, 150 calories each. So worth every bite! enjoy a successful keto dairy free treat. 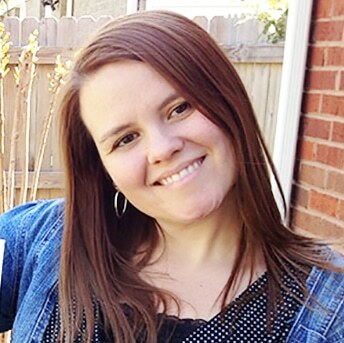 I’m almost 60 lb down and my hormones are finally better doing keto, so this can really help when I’d love a creamy treat! Thanks! Such a simple and yummy idea! I am a Watkins consultant, so I have LOTS of extracts and flavorings – peppermint, lemon, rum,coffee, etc. I plan to try these with each of them. They sound and look delicious! Thanks for posting.